A 12-mile lake of liquid water has been discovered on Mars for the first time as scientists hunt for alien life on the planet. The huge lake lies beneath the red planet‘s southern ice cap. 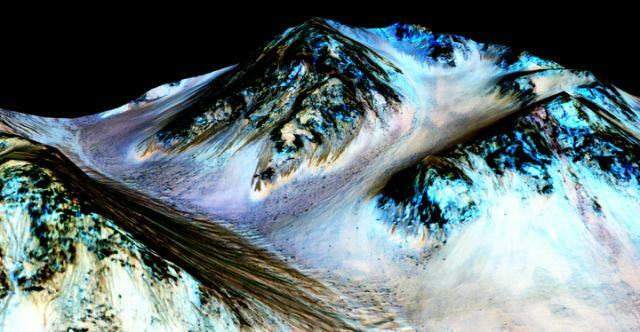 It is the first time a large stable body of liquid water has been discovered on Mars. The discovery, which has major implications for the chances of life surviving in Martian conditions, was made by an orbiting European probe using ground-penetrating radar. Prof Roberto Orosei from the Italian National Institute for Astrophysics, who led the study, said: “This is the place on Mars where you have something that most resembles a habitat, a place where life could subsist. “This kind of environment is not exactly your ideal vacation, or a place where fish would swim,” Orosei added. In 2015, NASA reported that it had found the strongest evidence so far that there was water on Mars, but were not able to confirm its existence definitively. NASA’s Mars Reconnaissance Orbiter detected mysterious streaks on the planet’s surface that appeared to ebb and flow over time, and scientists believed the movements of the flows could be attributed to the presence of water. John Grunsfeld, astronaut and associate administrator of NASA’s Science Mission Directorate in Washington, said at the time: “Our quest on Mars has been to ‘follow the water,’ in our search for life in the universe, and now we have convincing science that validates what we’ve long suspected. NASA’s Mars probe began its mission in 2011 with the objective of discovering whether or not microbial life could ever have been supported there. In June this year NASA’s curiosity rover found new evidence to suggest the planet could have supported ancient life.